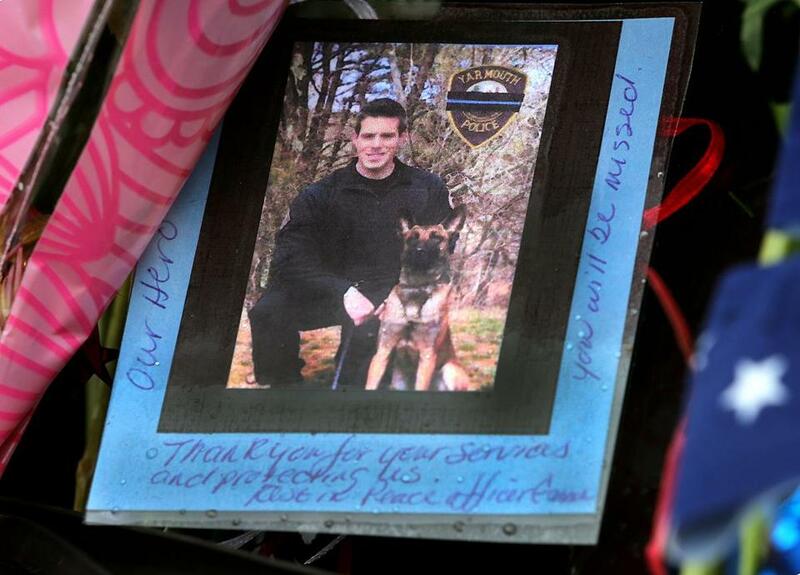 A photograph of slain Yarmouth K-9 Officer Sean Gannon and his dog on the windshield of his cruiser, which was adorned with flowers parked outside the Yarmouth Police station Friday. Thousands of police officers from around the country will travel to Yarmouth on Tuesday to pay their respects to Officer Sean Gannon, who was shot to death last week while serving an arrest warrant, officials said. Gannon’s wake is scheduled for 4 p.m. to 8 p.m. at St. Pius X Church on Barbara Street in Yarmouth. A Mass for Gannon will be said Wednesday at 11 a.m. at the church, State Police said in a statement. Burial will be private. Yarmouth Deputy Police Chief Steven G. Xiarhos said Monday that thousands of police, including officers from Texas, California, and Illinois, are expected to attend. Gannon, 32, was allegedly shot Thursday afternoon by Thomas M. Latanowich, a 29-year-old career criminal with more than 100 prior charges to his name. Police have said Gannon was trying to apprehend Latanowich, chasing him into the attic of a Marstons Mills home, when the convict shot him in the head. Latanowich was wanted on a probation violation. He is being held without bail on charges of murder and mistreating Gannon’s canine partner, a police dog named Nero. Mourners paid tribute to Sean Gannon’s sacrifice with simple acts of grace: sharing memories, offering consolation, placing flowers by a parked cruiser. Over the weekend, the Yarmouth Police Department said on Facebook that officers will never utter the name of Latanowich inside their building or in any of their press releases. The Auburn Police Department, which lost Officer Ronald Tarentino on a line-of-duty killing in May of 2016, voiced support for their fellow officers in Yarmouth in a response posting on Facebook. “This post is shared from Yarmouth PD, but we agree with the sentiment and anger that they are sharing; having gone through a very similar situation less than two years ago with Officer Tarentino,” Auburn police wrote. Jorge Zambrano, the man who shot Tarentino to death, had a lengthy criminal history including assaults against police officers. Zambrano was killed in a shootout with police in Oxford about 18 hours after he murdered Tarentino, authorities said. On Monday, the Yarmouth police official website included a link on its homepage for visitors to donate to the Sean Gannon Memorial Fund. Milton J. Valencia, John R. Ellement, and Shelley Murphy of the Globe staff contributed to this report.